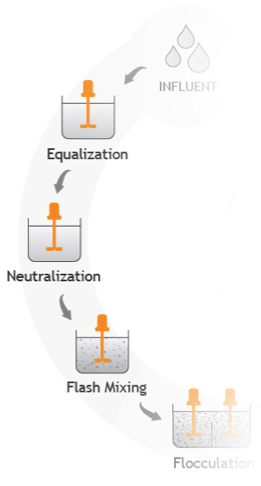 Neutralization, also known as pH control, is the process of adjusting or maintaining a desired pH level in the wastewater. The objective of neutralization is to bring effluent wastewater to a neutral pH of 7.0, meaning neither acid nor base, making it suitable for discharge. The acceptable pH level of the discharge varies by location and the destination of the discharge (such as a stream, a well or a sewer leading to a municipal waste treatment plant). While the wastewater is being recycled, its pH level is continuously monitored. Probes that measure effluent pH levels are located in the outlet flows, which are connected to metering pumps. The metering pumps feed caustic or acid into the inlet line in order to balance pH levels within the neutralization tank. A mixer is used to blend the neutralizing chemicals into the waste stream, quickly bringing the mixture to uniformity. Two or more neutralization mix tanks are often used in series to prevent fluctuations in effluent pH levels due to heavy surges of highly acidic or basic influent. After the adjustment chemical is added and the contents of the tank are thoroughly mixed, the pH of the wastewater batch is measured again to confirm that it is within the acceptable range. If the pH is acceptable, the contents of the batch neutralization tank are sent to drain. If the pH is not acceptable, another adjustment cycle is executed until the desired pH level is achieved. For complete neutralization to occur in a specified amount of time, the acidic and basic waste volumes in the batch tank must be thoroughly mixed. A properly optimized mixer will provide thorough mixing of the wastewater and adjustment chemicals, and achieve at least 16 complete tank turnovers within the tanks residence time. 1,600 gallon tank with a process flow rate of 100 gallons per minute. Residence time of wastewater in the tank is 16 minutes. The mixer will need to achieve 16 complete turnovers in the 16 minute time-frame, so the process would require a mixer producing at least 1 turnover per minute (or a minimum mixer pumping level of 1,600 gallons per minute). If solids are present, mixing levels will need to be adjusted to ensure their suspension. Please refer to our article about Solids Suspension for more details about sizing mixers for this type of application. Chemical resistance affects the selection of wetted materials. Special coatings or alloys are often required to protect against harsh acids. Dynamix offers a variety of Metallurgy and Coatings to suit the mixing of pH adjustment chemicals. Our application engineers work with our customers to understand their needs and provide the best solution for the application. Excellent customer service, from order placement to on-the-dock delivery!